I’m still in high school but I just flew from San Francisco to New York City to be a sponsor at a high school hackathon so, yeah, you already know that the whole experience was pretty awesome. It started on Friday, June 15th, at around 3:00 AM to finish packing up and drink a cup of coffee before taking a Lyft to the airport (SFO). Security wasn’t too painful this time through since I spent a good portion of my time standing in the line just figuring out what electronics and items I’ll need to place into the bins before they go through the scanner. Immediately proceeding the security process I grabbed another coffee from a cafe in the airport and stood around before I needed to board my flight. If you’ve never flown on an airplane and you say that sleeping on the flight or even taking a nap is as easy as it gets, you’re dead wrong. I spent a good half hour wiggling around before I got into a position that was somewhat comforting and then took a 40 minute nap. As soon as I woke up from that, I took out a laptop and worked on the presentations I was going to give at the event. As per our sponsorship agreement, I was going to give a five minute talk during both the opening ceremony and the closing ceremony as well as lead two workshops. In hindsight, I should have taken more photos during the flight since the view outside the window was just spectacular. The only way I can describe it is as a few hour long overview effect. Upon landing in the New York airport (LGA), I got my bags and got a ride to Brooklyn where I stayed the night. Now it was Saturday and already the time zone difference was a bit awry because the time I woke up would have been the peak of an all nighter in Pacific time. I had a quick breakfast then took the Q over to Manhattan for StuyHacks. As a San Francisco native taking the New York subway system and then walking in Manhattan downtown (it was Chinatown but New York City is big and confusing enough for me to simply call it downtown), it was certainly a different environment. For starters, it was pretty hot, like well beyond the hot it gets in San Francisco where it’s always foggy. Additionally, there’s a good amount of traffic and honking in the street which puzzled me as to why anyone bothered driving if all they’re doing is sitting around all day. Once I entered the venue, I was greeted by the team then I laid out a bunch of Repl.it stickers on the table for attendees to pick up and place on their laptops while checking in to the event. People were moving about and getting ready for the event and hacking. Now it was time for opening ceremony and they started by introducing the team and the venue as well as a handful of ground rules for respecting the space along with others. I was the only sponsor aside from the venue present and this was Repl.it’s first hackathon sponsorship so I knew I needed to make this introduction hit the nail right on the head. As soon as I came up, I immediately rejected the microphone which everyone else had used prior to me, I have a loud voice that people could hear in that small space. I stated a quick sentence or two introducing myself and then I stated to everyone “raise your hand if you’re awesome… you should all be raising your hands because you’re all awesome! I flew here from San Francisco because you’re that awesome”. I was pretty excited to say that since I had thought of that a week prior to the event and thought it would sound good and, when I said it out loud during the opening ceremony, it sounded pretty awesome. The funniest moment during my opening ceremony spiel was as I was explaining what Repl.it was to the attendees. Repl.it is an online IDE and development environment, which I said, and then I proceeded to state that Repl.it meant “If you have a browser, you can code” as well as it being “emacs for the modern age”. The chances are that not too many of you reading this will understand what that emacs thing meant but, for people attending the event, they all understood the joke and laughed. This was pretty surprising since it’s not everyday that you see high school students knowing what emacs is let alone a whole room of them. The reason this occurred was because, at Stuyvesant high school, a computer science teacher has his students use emacs for his class so they all had the pleasure of pressing C-x C-c on their keyboards and opening vim instead. I led the first workshop right after the opening ceremony that taught people how to make their first website using HTML and CSS. This was meant to be a very beginner workshop for people that have either never coded before or were at their first hackathon so that they could have a project to work on throughout the event and have something to display at the end. We spent 90 minutes working on creating their websites and then we spent 30 minutes presenting the websites. The coolest part about this workshop was that one of the people attending actually continued working on her website and won a prize at the end of the hackathon! As soon as the workshop ended and we finished presenting, we all dispersed to wherever we were headed next. For people that were attending my workshop, it mean to wherever they were working and, for me, it meant a good distance up North to pick up Repl.it t-shirts! I found my way there and back with ease [and Google Maps]. When I came back, there was a long line for lunch but many people sitting down waiting for the line to get smaller before getting up. I had the box of t-shirts in my hands and, for the fun of it, I shouted out “I got repl.it t-shirts but they’re in limited supply so first come first serve!” Immediately a crowd rushed me for the t-shirts and within moments I was out of t-shirts to give. However, I did get a dope picture with a bunch of people wearing repl.it t-shirts. My next workshop to lead was actually the last workshop and it was going to be at 9pm whereas it was just past noon at the time of the picture so I had some time to kill but I spent a good portion of it with the mentors and checking in with attendees as well as their hacks. Some time after dinner, it was time for my second workshop and there were some people from the first workshop in the morning so it was nice seeing them come back. The topic for this workshop was APIs and, for this one, I went through the process of checking out the docs for the Giphy API(it’s pronounced “gif”) and then incorporating it into a hack where the intent was more along the lines of how to use an API in a hack since APIs tend to be a pretty big component of projects at hackathons. Now people were heading to sleep and, at 3 in the morning, they held a karaoke contest in which I went up and sang an 80’s classic (yes, I did go up and I got all the high notes). As soon as I finished letting my heart out singing, I took a quick nap to get ready for the closing ceremony. For the closing ceremony, they went through the winners and what their hacks were. Like the opening ceremony, I had five minutes but I had the closing ceremony spiel be more conclusive than the opening one and have it end on a strong note. I thought the “raise your hand” activity was nice but, to change it for the closing ceremony, I said to “give me a yeah” if something applied to them. Again, I started with “if you’re awesome” and then followed it up with nice closing questions like “if you learned something new” as well as “if you had an amazing time”. The note I left off with was to not stop hacking and I tied that into using Repl.it so that people can continue shipping without stressing over local set up and configurations. 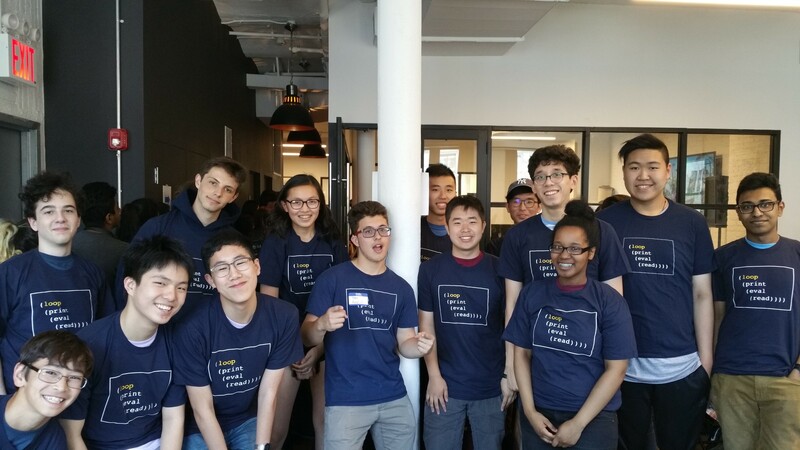 And that my experience being a sponsor as a high school student at a high school hackathon! If you’re organizing an event that you would like to see Repl.it at or just want to say hi, feel free to shoot me an email at [email protected] and till next time!